Each aging generation’s lament will take its turn occupying a front row seat in the Theatre of Memory, and so mine has squatted, seemingly for the long haul. Nothing reminds me more of what I miss (my Manhattan years were from 1971 through 1986) than dog day afternoons. Pace slowed to a trickle, mirrored by air conditioner unit condensation leaking in air shafts and over front stoops. The days were punctuated by sips of iced coffee snuck into dark old-movie houses showing double features of film noir, screwball comedies, selections chosen for “Tearjerker Mondays,” gangster flicks with Cagney, Bogart, and Raft, foreign films, silents with live organ accompaniments, and any other permutation that might appeal to film fanatics, which made up a decent chunk of the population and now included myself, in 1971, a recent immigrée. Contrary to providing escape from New York, in my mind they instead were collaged-on additions to my adopted city–annexes and alleyways and scaffolding and fire escapes of film clips–altering the landscape of my suburban Sound of Music sensibilities forever. Summer in the city is the trigger that sends me back to a lumpy seat in a small, dark revival house. Happy as a Manhattan clam. Forget stadium seating and Moviefone–I stood on line at the Thalia (just one of many of a dozen or so, in their hey day of the late 1970s and early 80s) for the privilege of seeing a double bill that was artfully arranged into a summer series theme by the owner, usually a film buff who probably also ran the projector. The Village Voice ads were the first alert to what was playing. Once inside the dim cave of the theater, I adjusted my sensibilities to a floor that perversely slanted up to the small screen, then hunkered into my worn upholstered seat to peruse in depth the film schedule flier, which I would then take home and tape to my refrigerator. Here is where I discovered the nascent Scorcese, Polanski, DePalma, and DeNiro; where Knife in the Water was paired with Sisters; where I caught the French New Wave (the name “Antoine Doinell” repeating itself in my head like a mantra and Claire’s Knee jerking me to attention as I tried to revive my high school French). 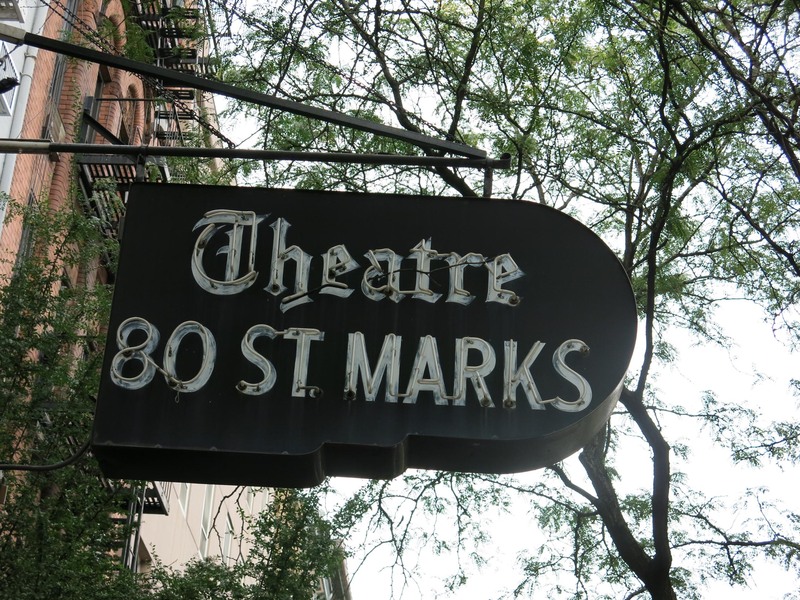 Nearly ninety blocks further downtown I would nestle into an even lumpier seat at Theatre 80 St. Marks for a Depression-era Busby Berkeley kaleidoscoped double bill, and nurse the regret that I never learned how to tap dance. 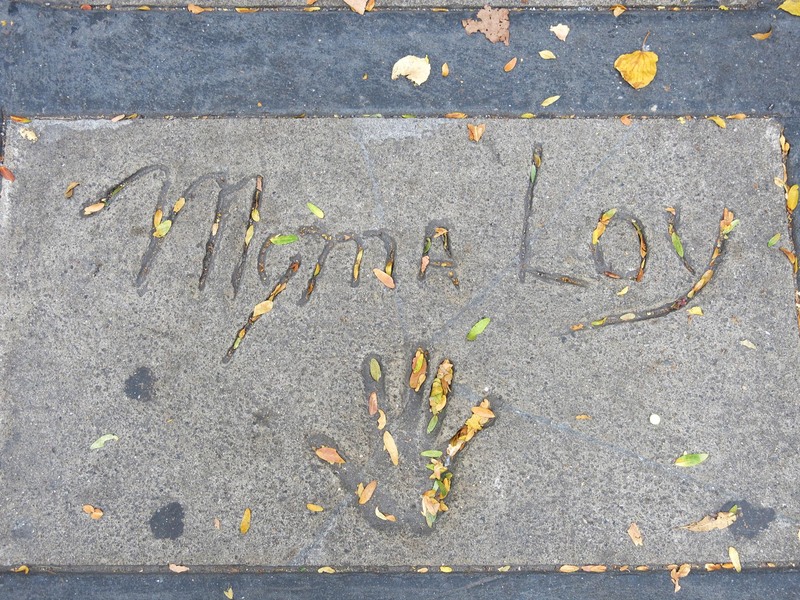 I squeezed my feet into the footprints in cement at the entrance, made by aging movie stars in their waning years. Ruby Keeler, Myrna Loy, Joan Blondell…what passerby notices or even knows these names today? I visited them all. I got my fill of Freaks, Footlight Parade, and Sherlock, Jr.
Detour, Hi, Mom!, Rear Window. Jailhouse Rock, Jules and Jim, Carnival of Souls. To Each His Own, White Heat, La Dolce Vita. My Man Godfrey, High Noon, The Sweet Smell of Success. And on, and on, and on. It was heaven. Besides a film education, they offered an alternate reality of the city. I exited the theater; an anvil of heat would smack me in the face as I immersed myself into the atmosphere of shimmering asphalt and refracted car exhaust fumes. Claiming, like Ratso Rizzo, my rightful place on the streets on a dog day afternoon. No East Hampton escape for me. I’m walkin’ here! The theaters are largely gone, or transformed: the Thalia, the Elgin, the 8th Street Playhouse, the New Yorker, the Bleecker Street Cinema, Theatre 80. But when the temperatures get real hot, I’m there in that Theatre of Memory, kicking back with my iced coffee. Beautifully written (of course) and, even tho my dog-day afternoons were spent in the Midwest, beautifully nostalgic. Thanks, Matt~ dog days certainly are not exclusive to NYC! And thanks for name-dropping my all-time-favourite movie, “Rear Window” (remember when all those long-out-of-circulation Hitchcock movies were reissued in the mid-80s … what a revelation). “Happy as a Manhattan clam.” Love it. Also, interesting to read this and consider after just watching a doc the other night, NY77: The Coolest Year in Hell. And speaking of NYC, so great to meet you when there! This entry was posted on July 20, 2015 by DIRNDL SKIRT in Film, Memoir and tagged cinema, dog day afternoons, NYC dog days, nyc early 1970s, old movie houses, old movies, revival houses, summer in the city, the Thalia.